After Kalinga war, the known history of Odisha is obscure. With the discovery of the Hathigumpha inscription at Udayagiri by Andrew Stirling in 1820 a flood of light is focused on this dark period. The inscription is written in Brahmi script. It contains 17 lines, which describes the glory and achievements of Kharavela and most historians agree with the fact Kharavela was a strongest ruler. It is believed that Kharavela was a follower of Jainism, but his very own Hathigumpha inscription describes that he was tolerable towards all religious . However, there is no Jain records or inscription that mention Kharavela. The Hathigumpha inscription says that the first 15 years of Kharavela were spent as childhood. During this, he was trained in coinage, literature, mathematics, administration and religious laws. At the age of 16, he ruled as the crown prince (Yuvaraja) of Kalinga for 9 years. At the age of 24 year, he became the king. He ruled somewhere in the first century B.C either 40 B.C or 41 B.C. The Hathigumpha inscription of Daygiri describes the first 13 years of his reign as follows. He tried to re-construct his kingdom. He repaired the gates, statue and buildings of Kalinganagari, that had been damaged by cyclone. He built polls, that contained cool and clear water, for which he spent 35,00,000 coins. Kharavela's imperial ambition took place in the very second year of his regime. By that time Satavahana dynasty has become very powerful. As both the Chedi and Satavahana rose to be political power, a clash between them occur. Without caring the powers of Satakarni-I, Kharavela marched up to the river Krishna and stormed down the city of Asika. In the third regnal year, Kalinganagri overwhelmed with joy and jubilation. He organized dancing, singing, vocal and instrumental music event. Ceremonial and social gatherings were arranged. The over-all city danced with happiness and glory. This line of the inscription is broken, hence hard to understand. According to historians, Kharavela marched towards the Deccan again and subdued the Rathika and the Bhojaka kings. This part is also broken and not clear. It appears that Kharavela extended the canal originally built by the Nandaraja, from the Tansunia road up to Kalinganagri, which is a clear indication that he was a benevolent ruler. He attained fatherhood, as the chief queen named the queen of Vijayanagara gave birth to a son. In the 8th regnal year, he led an expedition to North and attacked Rajagriha and devasted Garathagiri, which created fear among the Yavahana. 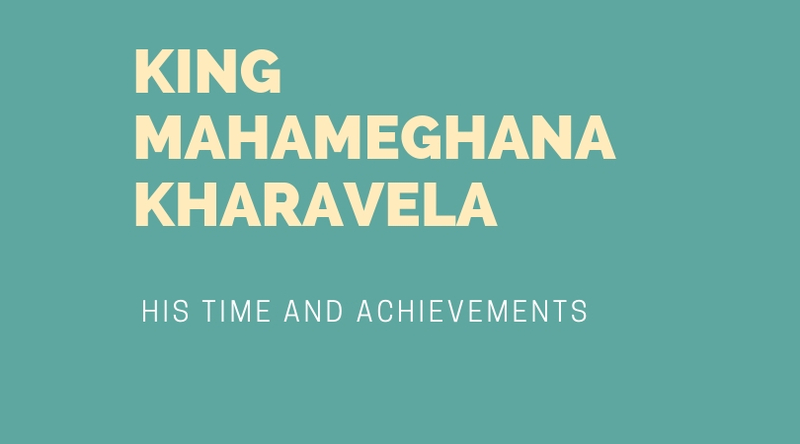 Kharavela distributed wealth gained from exploits among Brahmins and Arhats.In order to celebrate his victory over the kings, he built Mahavijaya Prasadam (Palace of Great Victory) by spending the cost of 3,800,000. He directed his army towards North India but result is unknown as most part of the record is lost. In the inscription there was the mentions of Bharatavarsha, a term now used as a name of India. In the 11th regnal year, Kharavela ploughed down the Pithunda city, founded by the Ava king. Further he fought a severe battel against the Tamil Confederacy. The important parts of this record are lost. The record mentions that Kharavela marched up to north-west India. By his aggressive march, Indo-Greek rulers, the king of Anga and Magadha surrendered. Most importantly Kharavela brought back the image of Kalinga Jina. In this year by the request of the queen of Simhapatha, he built 117 caves at Udayagiri (Kumari Parvata) for the Jaina monks, monks of other religion and Arhats who came from a distant place to take rest. During the reign of Kharavela, Kalinga achieved freedom, Magadha was subdued, Deccan was crushed, foreign aggressors were driven away, Jainism gained momentum, trade and commerce flourished, which proves that he was one of the capable rulers in the early history of Odisha. It is unknown when and how the Chedi rule ended in Odisha, but the name of mighty ruler Kharavela remained with golden stamps in the white paper of golden history of Odisha.